At 11 a.m. on a Wednesday morning in early March, a steady stream of customers flows through the door of Middle Park Meat Co. in Kremmling. The line at the counter is six people deep and two people are waiting on customers. Every time the place starts to clear out, an new wave of people walks through the door. After nearly an hour standing there, it’s been almost impossible to catch a word with the shop’s new owner. Watching all this, it’s hard to believe there’s a recession under way. People aren’t just buying steaks for dinner. They’re walking out with armloads of lunch meat, ground meat, cheese, beef jerky, lamb, fish and then, just before the sale is finalized, grabbing one last thing – perhaps a jar of lingonberry jam off the shelf next to the register – to add to the order. Land retired Tuesday after running the business with the help of his wife, Jane, for 35 years. “We have decided to let the younger people have a go at it,” the Lands wrote in a letter to their customers. Mike Sidler, 24, and his partner, 22-year-old Felicia (Fee) Gaston have purchased the business. Sidler and Gaston are from neighboring small towns in Kansas – Strong City and Cottonwood Falls. Together the two towns are about the size of Kremmling. Strong City is a railroad town where the cows outnumber the people 10 to 1, Sidler said. It was a town with a small butcher block, where Sidler worked a bit in high school. When he graduated, Sidler headed for the Rocky Mountains. He landed in Kremmling because it was affordable. He landed a job at Middle Park Meat and has been working with Land for the past six years. Gaston worked for Blue Mountain Ranch after graduating from high school. A mutual friend put the two in contact after learning they were both in Kremmling. Sidler will manage the meat side of the business and Gaston will do the books. 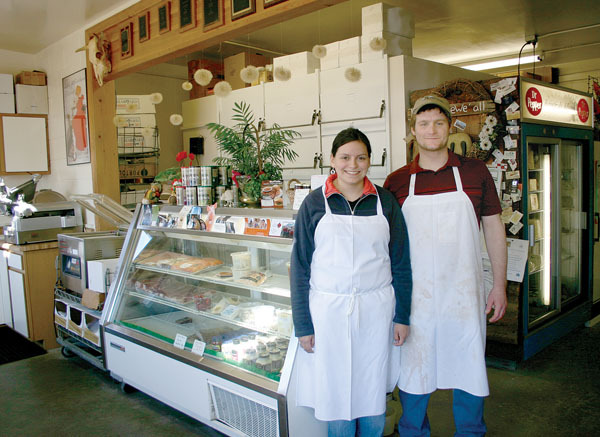 Both will man the front of the shop with the help Judy Romero, who has worked at Middle Park Meat for 18 years. More people pour into the shop. Land throws on his white apron one more time and jumps in to help. He opens the drawers from the tall stacks of 1930s era meat lockers to pull out a special cut for a customer. He unfolds the white paper to show the man the cut, receives a nod, then wraps the meat back up and grabs a few more. Land insists that it’s time to retire, (“I don’t want to be the busiest guy in the graveyard,” he said), but the business is clearly in his blood. He’s been cutting meat for 46 years. He believes in quality. He’s devoted to his customers. It was the customers that kept him going the past few years, Land said. He’s been wanting to retire for a few years now but felt a responsibility to his customers to keep the business going. Several people expressed interest in buying the place, but with the tough times they were never able to get the financing. “I didn’t feel like I could just turn it over to anybody,” Land said. Sidler seemed like the perfect choice. It’s in his blood, too. He loves his job, the town and the customers as much as Land, and he’s earned his mentor’s faith and trust. “I feel very comfortable that the customers will be well taken care of,” Land said. Another advantage of selling to Sidler is that he knows the business and can hit the ground running, Land said. iddle Park Meat Co. was founded by Joe McElroy in 1958. It operated primarily as a meat processing plant, changing hands once along the way, until Land bought the business in 1975. Finding that the processing part of the business wasn’t paying, Land turned his focus to the retail aspect. He added on to the front of the building, installed a smoker and updated all the equipment. He started making his own lunch meat, curing and smoking his own bacon, grinding his own burger and jerking his own beef and buffalo. The beef he sells is certified Angus, high choice, aged beef. He sends back anything that falls short of his standards. The meat he sells comes from three different suppliers: JBS and Stillman, both of Colorado and Stockyards of Illinois. All the lamb comes from Colorado. It’s Land’s award-winning smoked products that bring people back. Devoted customers travel from as far as Steamboat Springs, Summit County and Winter Park to stock up on his apple-cured pork chops, hand-cut hickory smoked bacon and smoked red trout. Dozens of new customers still walk into the shop every week, Land said. The jerky is so popular that the shop has to smoke 240 pounds of beef and buffalo a week just to keep up with the demand, Land said. Middle Park Meat also brings in fresh fish from the Seattle Fish Company several times each week. “It’s the freshest fish you’re going to find in central Colorado,” said Sidler. It also sells bulk cheese and gourmet specialty items like salsa from Pueblo, Boar’s Head horseradish and lingonberry jam. Sidler doesn’t have plans to make any changes: “It’s not broken so we’re not going to fix it,” he said.